I’ve always wanted to overwinter a geranium plant. While growing up, the minister of our church did in the sunny windows of the Sunday school. The barber shop down the street has big, bountiful blooms in its sun-soaked window. 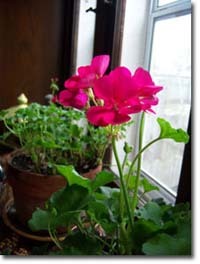 Overwintering a geranium has an old-fashioned charm to it, like hollyhocks and bleeding hearts. Experts suggest cutting back your plants by one-third to half. I couldn’t do this- too chopped off for interior viewing. I wanted my geraniums to look good on Thanksgiving. So I am taking the vigilant indoor gardening approach. On a nearly daily basis I pick off yellowing leaves or any leaves that are etoliating themselves too high toward the distant sky. I will continue to do so to help in forming a fat, bushy fellow. And I have my babies in the sunniest window I have- a south facing trio on my dining room buffet. Thus far I am erring on the damp side. I re-potted the plants in a new soil and pots and created a very well-drained situation. I am witnessing noticeable daily growth and the process is really keeping my gardening spirit alive. As a matter of fact, sometimes I think how nice and manageable it would be to tend this tiny of a plot in the summer. It will be nice to move these old friends outside next spring.